Following on from our recent posts on Sulfate Free Shampoos, Paraben Free Shampoos, we thought we’d take time to look at another infamous additive to our shampoos – Silicone. If you scour the internet long enough you’ll find that Silicone is blamed for virtually every skin condition known. And even unknown in some spurious cases. There’s an awful lot of misinformation out there. In typical Dandruff Deconstructed fashion, the purpose of this article is to look at the science – the facts – and let you come to your own conclusion on whether to use silicone based shampoos. Why are silicones used in shampoo? That said, in your typical shampoo silicone has typically been added both condition and moisturize your hair. Adding a distinctive shine in the process. Some silicones achieve this by forming a homogenous film on the hair. Suppliers claim this affect provides protection for the hair strengthening it in the process. You’ll probably have experienced this yourself when your hair feels incredibly soft and easy to comb after using a shampoo or conditioner. Often this is because of the additions of silicones. What are the differences between silicones? That’s lot of cones and xanes! While silicones have many different uses, they can be neatly categorised based on their molecular structure. The most commonly used silicones are modifications of polydimethylsiloxane (PMDS). PMDS is a silicone polymer, comprised of a basic silicone unit that repeats 90 to 410 times . The number of repeating units, and the chemical structure of the unit, can be modified in order to create a silicone molecule with desirable qualities. Modification of the repeating unit can help to explain the differences between simple ‘linear PMDS’ like ‘dimethicone’ and ‘dimethiconol’ – in which the -methyl group of dimethicone is replaced with an -alcohol group to form dimethiconol. This can alter the solubility, and reduce the force required to comb hair . Through a similar process new silicones with novel properties can be created, such as ‘phenyl trimethicone’ and ‘stearyl dimethicone’. A more significant modification to the repeating unit can create ‘cyclic PMDS’ silicones. These silicones contain less than six repeating units, and so quickly evaporate, compared to larger ‘linear’ PMDS such as dimethicone. Cyclomethicone and cyclopentasiloxane and are examples of cyclic silicones, and typically add gloss to hair and reduce drying time – useful to reduce damage from hot air drying . What are the potential risks of using a shampoo with added silicone? Simple modifications to the silicone molecules can lead to a huge variety of beneficial qualities (e.g. glossy hair and reduced static), but a number of concerns have been raised. A widely publicised problem with silicones in shampoos is that they coat hair with a fake plasticy sheen. This coating can build up over time. This prevents natural hydration and can cause dry and damaged hair with prolonged use. Concern has been raised over the ability of silicones to cause contact dermatitis. Although extremely rare there is some but little literature on this allergy – few studies exist on the subject. On the flipside – silicones are used in treatments for dermatitis, to form a barrier against irritants .Finally, silicones are said to accumulate in the environment and there is growing concern about the environmental impact. The silicones used in cosmetics are typically biodegradable and non-toxic to animals and plants. The same can’t always be said for silicones used in industrial processes . What are the alternatives to silicones? You’ll find a number of alternatives to silicones in shampoos today. Some of them are probably as bas a silicone in terms of side effects, but there are some other excellent alternatives. Mineral oil (or ‘paraffinum liquidum’ on UK cosmetic labels) is refined from petrochemical processing – which isn’t to say it’s harmful, but it certainly isn’t an environmentally-friendly alternative. It’s a mixture of a number of oils, which can leave hair feeling glossy, in a similar way to silicones. The oil still coats hair, and so it seems likely that the same concerns will be raised (e.g. causing dry hair with prolonged use). Polyethylene glycol (PEG)-based emulsions are the most common alternative to silicones in shampoos . PEG is similar to silicone in that it’s a repeating unit, which coats hair leaving it feeling glossy. There are biodegradable variants, although the manufacturing process may not always been ‘green’. This biodegradable wheat based alternative to silicones has a very low molecular weight, which helps to ensure a deep penetration into the hair fiber. This provides an effective strengthening from within, and helps to reduce hair breakage by around 80%. It also creates a protective shield on the cuticle, making hair feel much smoother and easier to comb. Fatty alcohols like cetyl alcohol, behenyl alcohol, or cetearyl alcohol will form a film on your hair strands like silicone. They will also act as a conditioning agent on your hair. A long time favorite of Dandruff Deconstructed, unrefined coconut oil is absolutely outstanding to use if you have dry damaged hair or a dry scalp. It’s also low in oleic acid – an ingredient that has been shown to mimic and induce seborrheic dermatitis in sufferers . The desperately in need of a new name Guar hydroxypropyltrimonium chloride is quite a recent addition to shampoos. Although it is a synthetic ingredient, it is biodegradable and also water soluble (no more build up!). It’s a great conditioning agent, but it also neutralizes the negative charges on hair strands that cause hair to become tangled. It does this without weighing hair down. With this ingredient, you can have silky, non-static hair that retains its volume. Where can I find the best silicone free dandruff shampoos? Browse over to our dandruff shampoo search to find all our silicone free shampoos! 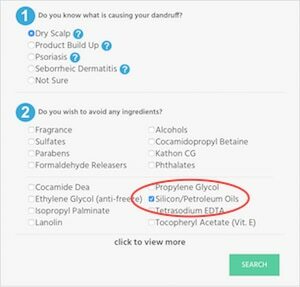 Simply select what causes your dandruff and indicate that you wish to find all shampoos that don’t contain Silicon/Petroleum Oils as shown below. 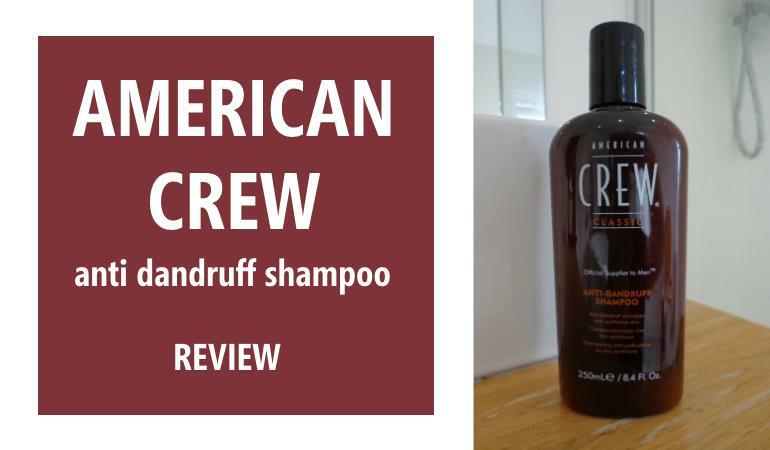 At the time of writing we have a ton of shampoos we’d recommend. 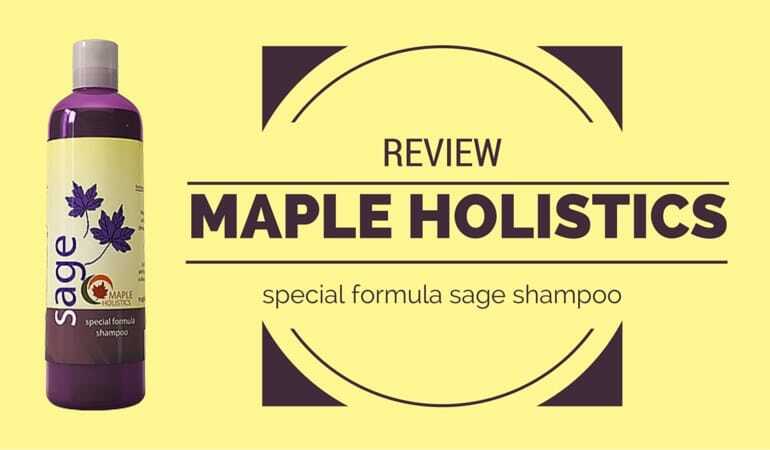 If you haven’t seen your favorite shampoo listed, chances are we have and it can be found if you check out all our paraben free dandruff shampoo reviews. Trüeb, R. M. (2007). 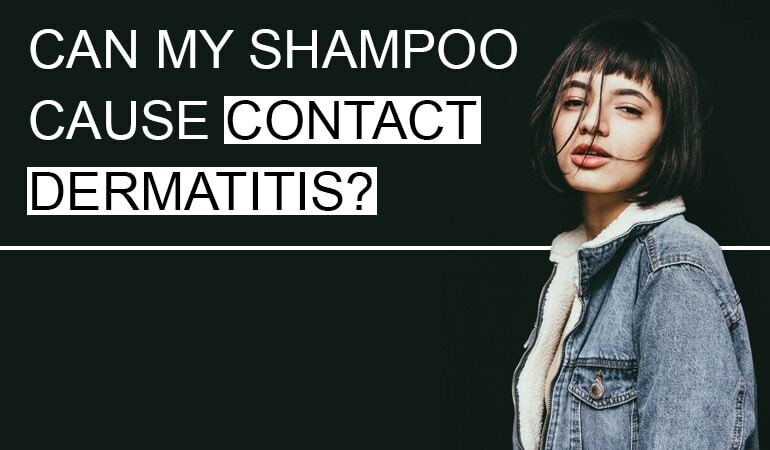 Shampoos: ingredients, efficacy and adverse effects. JDDG: Journal der Deutschen Dermatologischen Gesellschaft, 5(5), 356-365. Gray, J. (2001). Hair care and hair care products. Clinics in dermatology, 19(2), 227-236. Draelos, Z. D. (2008). Hair Cosmetics. In Hair growth and disorders (pp. 499-513). Springer Berlin Heidelberg. Bhushan B. (2010). Biophysics of Human Hair. Biological and Medical Physics, Biomedical Engineering; pp. 1–19. Bolduc, C., & Shapiro, J. (2001). Hair care products: waving, straightening, conditioning, and coloring. Clinics in dermatology, 19(4), 431-436. Tate, M. L., Kamath, Y. K., Ruetsch, S. B., & Weigmann, H. D. (1993). Quantification and prevention of hair damage. Journal of the society of cosmetic chemists, 44(6), 347-372. Draelos, Z. D. (2000). Hydrogel barrier/repair creams and contact dermatitis. American Journal of Contact Dermatitis, 11(4), 222-225. Stevens, C., Powell, D. E., Mäkelä, P., & Karman, C. (2001). Fate and effects of polydimethylsiloxane (PDMS) in marine environments. Marine pollution bulletin, 42(7), 536-543.